Peter Lorre stars in this series of Tales of Psychological Terror. "The Marvelous Barrastro Starring Peter Lorre"
When the voice on the other side of the speaker is Peter Lorre, well, we can't really be held accountable for nightmares, can we? Peter Lorre was usually type cast as a "creepy foreigner". He had been born Lazlo Lowenstein in 1904 Hungary, and began his acting career in a primary school production of "Snow White" in Vienna. In time he entered the Berlin theater scene, and was cast as a psychopathic child killer in the thriller M. M launched Lorre to international fame, but with his Jewish ancestry, he was lucky to flee Germany two days before the Reichstag Fire of 1933. Eventually coming to America, his typecasting seemed to follow him, try as he might to overcome it. 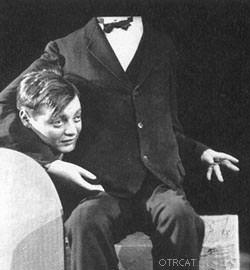 In fact many of his later roles were parodies of his earlier psychopaths. 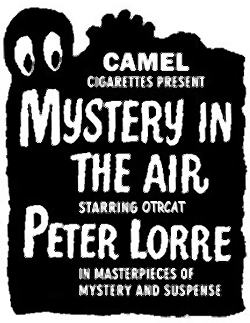 In 1947 Peter Lorre starred in Mystery in the Air, a summer replacement. The show used stories "of the strange and unusual... culled from the Four corners of World Literature." The show featured stories by Edgar Allen Poe, Pushkin, de Maupassant, Theodore Sturgeon, and Dostoevsky. The program had a regular stock of players, including Harry Morgan, who would go to later fame as Detective Joe Gannon on TV's Dragnet. Peter Lorre is remembered with a Star on the Hollywood Walk of Fame at 6619 Hollywood Blvd. See also Dark Fantasy, Escape, Inner Sanctum, Lights Out, Mysterious Traveler, Suspense, The Whistler, and Weird Circle. 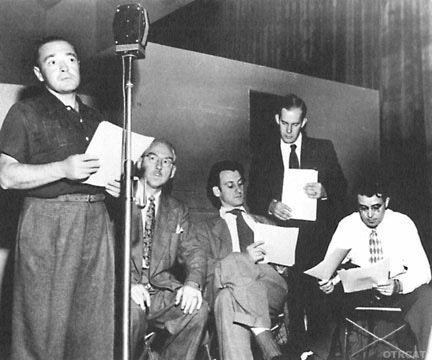 Be the first to comment on "Mystery in the Air (Peter Lorre)"